The University is holding an Earth Day essay contest for students in grades seven through 12. This year’s essay theme is “The Impact of Climate Change” and submissions must be postmarked by April 10. Area students in grades seven to 12 can participate in The University of Scranton Earth Day essay contest. 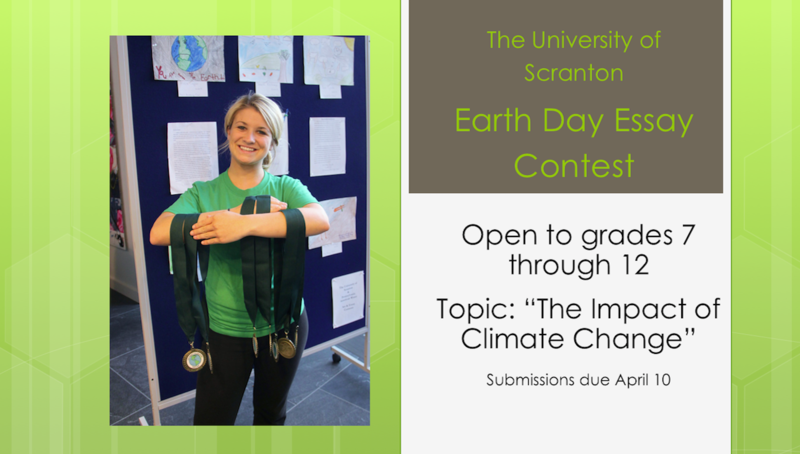 This year’s essay theme is “The Impact of Climate Change.” Essay submissions must be postmarked on or before April 10 and can be sent to The University of Scranton, Provost Office, 800 Linden Street, Scranton, PA 18510, Attn: Earth Day Essay Contest. Essay submissions will be showcased and contest winners announced at the Earth Day Evening of Environmental Science event on Thursday, April 19, from 6 to 8 p.m. in the Atrium of the Loyola Science Center. The event, which is free of charge and open to the public, will include refreshments and interactive science experiments and displays presented by University students. Visit the University’s website for submission rules and details, or call 570-941-7520.